Since we never tire of pizza in our house, I have been determined to find a protein packed crust alternative. One that actually holds up a few toppings without flopping of course! 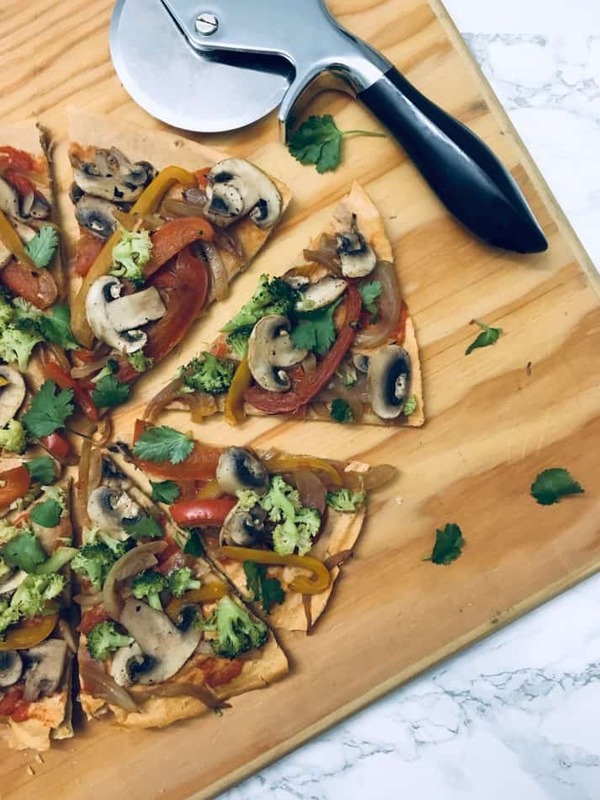 This gluten free lentil pizza crust is a big win in both departments! Plus, it’s so easy to make, it’s much lower in calories and carbs than traditional wheat pizza, and tastes great! Win win win! This pizza crust recipe is super simple to make! Just add all the ingredients into your blender and process until completely pureed. Then pour the batter onto a pizza tray and bake! It seriously doesn’t get easier than this! In fact, traditional pizza dough is far more time consuming and complicated than this easy recipe! Pour your mixture into the center of the prepared pizza tray, like you would a pancake. Then carefully spread it towards the edges using a silicone spatula. Try to make your crust as evenly thin as possible in order to get a crispy, firm crust. If some spots are thicker, you’ll notice they will remain a little soft when baking. But don’t worry, it will still taste great! Bake your lentil pizza crust for about 12 minutes before carefully flipping it and returning to the oven. 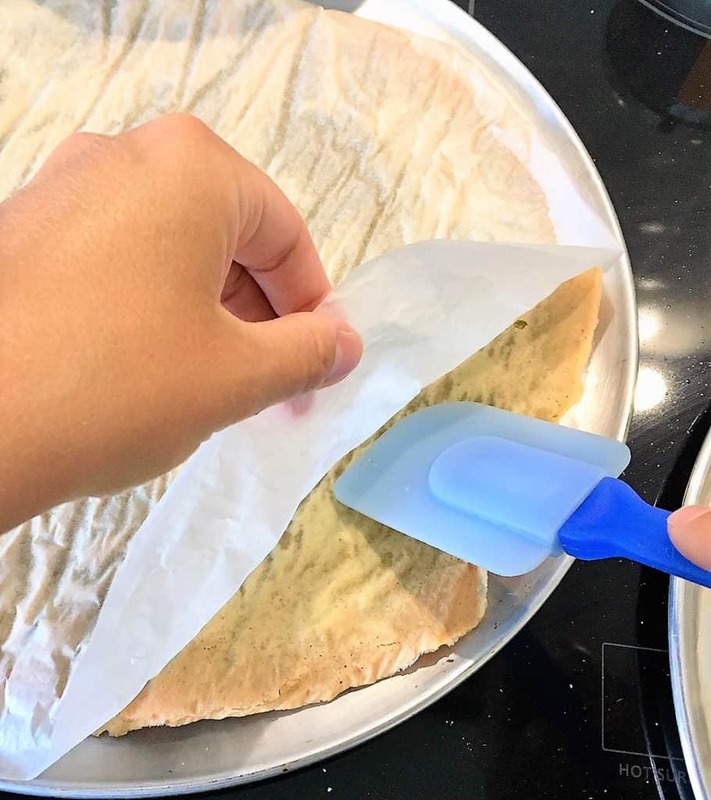 Use the parchment paper to help flip your lentil pizza crusts. I slide my crusts right off the pan by pulling the paper. Then I put a fresh sheet of parchment paper on the pizza tray and flip the crust over. Gently peel the original piece of parchment paper off with your hands and a silicone spatula as pictured below. Alternatively, you may grease your pizza trays, but if you’re trying to keep this as light as possible, I suggest the parchment paper route. Plus it really helps with flipping them, without breaking the crusts. Once the crusts are baked, top your pizza with any of your favourite toppings! I like to use my Homemade Tomato Sauce and sautéed veggies. To my husband’s portion I typically add a ton of jalapenos! Just remember to precook your veggies before topping your pizzas. Otherwise they will release too much moisture and might make your crusts soggy. 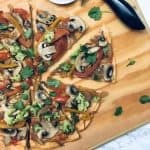 I hope you enjoy this healthy pizza recipe. Low calorie pizza that tastes great is really the best of both worlds! I’d love to hear what you think, so drop me a line in the comments below! 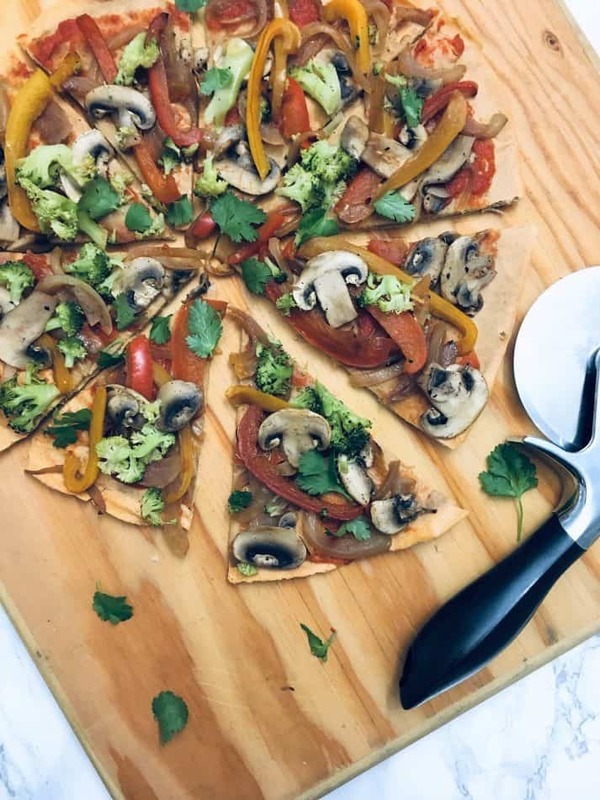 For a protein packed pizza alternative give this lentil pizza crust a try. It delivers big flavour, delicious crunch, and is free from gluten. 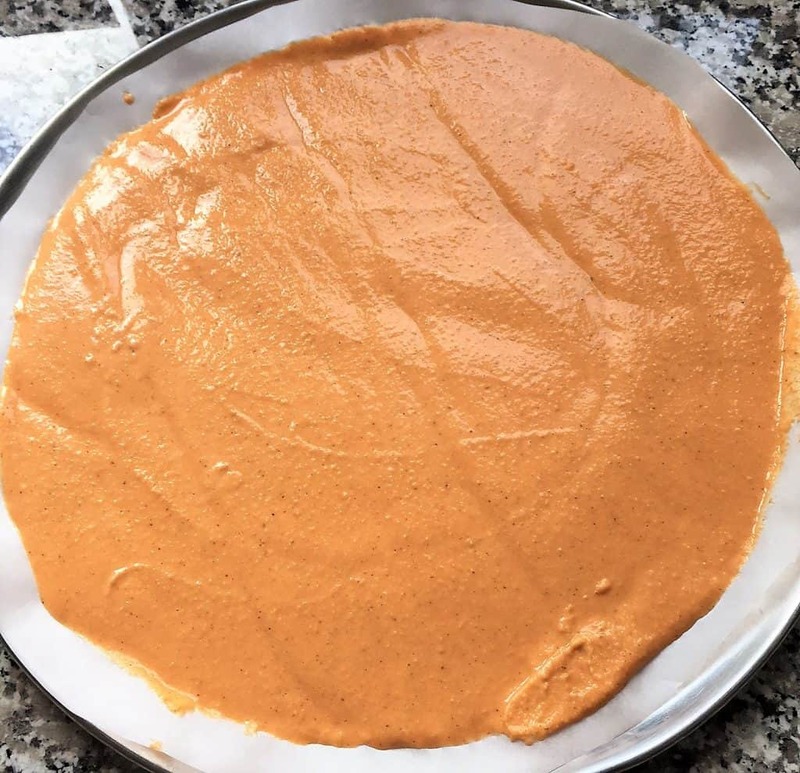 Line two 12" pizza trays with parchment paper and preheat your oven to 450 degrees F.
Add all the ingredients to a high powered blender and process on high until completely pureed. This may take 1-2 minutes. Pour half of the mixture onto each prepared pizza tray and spread it out thinly and as evenly as possible using a silicone spatula. Bake for 12 minutes. Then carefully flip the crusts* (see note below) and return to the oven and bake for 5 more minutes until edges are golden brown. Top your pizzas as desired (I used tomato sauce and sauteed veggies) and bake for another 3-4 minutes. Then remove from oven and allow pizzas to rest for a few minutes before cutting into 8 triangular slices. Use the parchment paper to help flip your lentil pizza crusts. I slide my crusts right off the pan by pulling the paper. Then I put a fresh sheet of parchment paper on the pizza tray and flip the crust over. Gently peel the original piece of parchment paper off with your hands and a silicone spatula as pictured above. The nutritional information is for half of a 12" pizza crust. Additional toppings are not included in the calculation. What a great recipe! We made it tonight (made1/2 a recipe). Our only comment: next time we’re going to try to make it more crispy. Maybe bake the crust on a lower rack? Or after the crust bakes, wait a while before adding sauce and veggies? Hi Sheryl, I’m so glad you enjoyed this recipe. To make the crust crispy, getting the “dough” as thin as possible is key. I try and spread my batter as close to the edges of the pan as possible, while keeping it evenly spread. If the center is thicker, it wont crisp up as much. But yes, definitely try the bottom rack, just watch carefully so the bottom doesn’t burn. Also, I don’t use a lot of sauce on this one, and precook my veggies until the moisture is evaporated to ensure no extra water/moisture is getting into my crust. Thanks so much for your feedback! Wondering if you have a dairy and nut free cheese recipe to put on top. I am going to try this. It looks so good and easy. Hi Mini. Unfortunately I don’t have a nut free option (yet). However, I have sprinkled nutritional yeast on top which does give a delicious cheesy flavour. Hope you enjoy! Tried this tonight. OH. MY. WORD. Absolutely fabulous!! As a soya free vegan I often rely on lentils as a source of protein. This is a new and fabulous way to eat them. I even made it for my hubby and he was blown away by it!! Thoroughly recommended! Thank you for sharing the recipe!! Hi Natalie, thank you so much for your feedback. 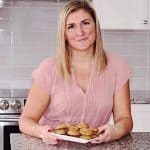 I’m so glad you and your hubby enjoyed this recipe! Are the split red lentils in this cooked or uncooked? Hi Natalie, the lentils are dry/uncooked split red lentils.